A professional learning experience that combines strategic foresight training with hands-on planning for the era of artificial intelligence. Strategic Foresight is a management discipline made up of mindsets, methods and frameworks that help people think holistically and plan more effectively in uncertain and complex conditions. The Foresight Sandbox is a unique multi-day, in-person learning experience at which participants learn the tools of strategic foresight and use them to prepare their organization for a future of accelerating technological change. The theme of our inaugural Foresight Sandbox is AI (artificial intelligence). We’ll cut past the marketing hype to contextualize and explore the many ramifications of AI–from implementation to ethics, security, workforce preparation and impacts on the competitive environment. Participants will have a hands-on opportunity to build scenarios of their future business environments using the same methods and frameworks of futurists, to uncover unexpected roadblocks and provocative opportunities that may have otherwise gone unnoticed. Join us in the Foresight Sandbox for serious play: Demystify AI, explore alternative scenarios , challenge your assumptions, and design prototypes for your organization’s successful future. Not sure? Call us at 202-594-9236 or email at Info@Prescient2050.com to discuss whether this course is right for you. What makes the Foresight Sandbox unique? The Foresight Sandbox experience singularly combines training in how to think and plan like a futurist with a deep exploration of an emerging technology. This combination is designed to meet the the equally singular conditions that face organizations today. Emerging technologies such as artificial intelligence and machine learning are critical to your future success and potentially disruptive, which makes understanding the context and implications of implementation especially important. Developing an AI or digital transformation strategy is not only challenging in itself but complicated by the flux and uncertainty in the global environment, where politics, energy, social and consumer trends, the natural environment, and other technologies driving change can also affect organizational success. The tools of Strategic Foresight are designed for planning in uncertainty. 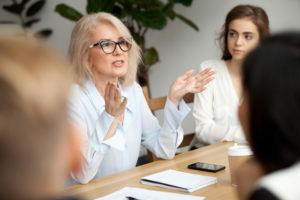 The Foresight Sandbox equips you to use these tools, then pairs them with an expert-guided deep dive into the possibilities and limitations of artificial intelligence in a collaborative, skillfully facilitated session with professional peers. You get an unmatched opportunity to build, test out, knock down, and rebuild potential ways that artificial intelligence moves could play out in different future business environments. This kind of exploration pays off by building knowledge, confidence and strategic agility. Just like playing in a sandbox, but much more exciting! 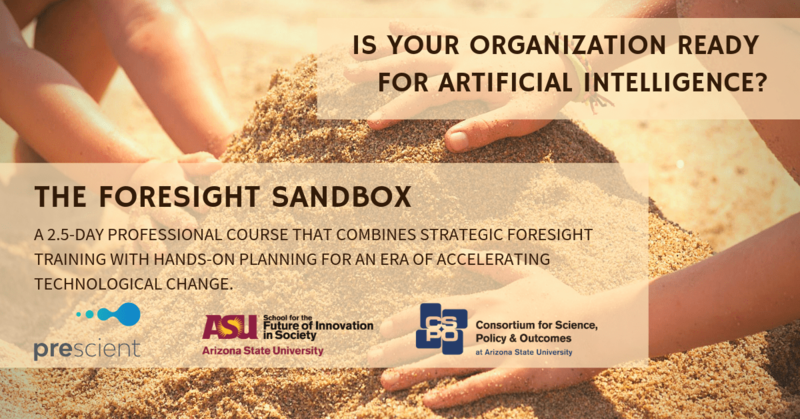 The Foresight Sandbox is co-sponsored by Arizona State University’s School for the Future of Innovation in Society (SFIS)(in Washington DC), the Consortium for Science, Policy & Outcomes (CSPO) and Prescient LLC. SFIS is a transdisciplinary unit of ASU committed to translating imagination to responsible innovation to build a future for everyone. Prescient LLC is a strategic foresight consultancy serving Fortune 500 companies, growing firms, government and military clients and non-profits and headquartered in Washington DC. The Strategic Foresight Sandbox is led by professionals with deep experience in facilitation, as well as corporate and government applications of strategic foresight, artificial intelligence, and additional relevant fields including behavioral economics, technology ethics and leadership. The course will be led by Dr. Amy Zalman, Prescient CEO and Georgetown University professor of Strategic Foresight. Additional instructors include Dr. James Kadtke, a converging technology consultant with 30 years of experience in government and business applications of technology and others will be announced shortly. Dates: June 17-19, 2019. Day 1 will begin at 11:00 am and the program will conclude on Day 3 at 4:30 pm. Inclusive of all meals during the course as well as a reception with speakers on Day 2, and all materials. It awakened me to global trends that I was not aware of but which are impacting my industry and ultimately, It’s easy to fall into the deception of thinking the world in which we are working and acting in is all there is. Prescient’s seminar gave me the chance to get out of my own bubble and think about the world in a different, more global and holistic way. The Corporate Ticket ticket is sold out. You can try another ticket or another date. The Government and Non-Profit ticket is sold out. You can try another ticket or another date.